How do I export compound data to EZinfo, and import results back from EZinfo into Progenesis QI? 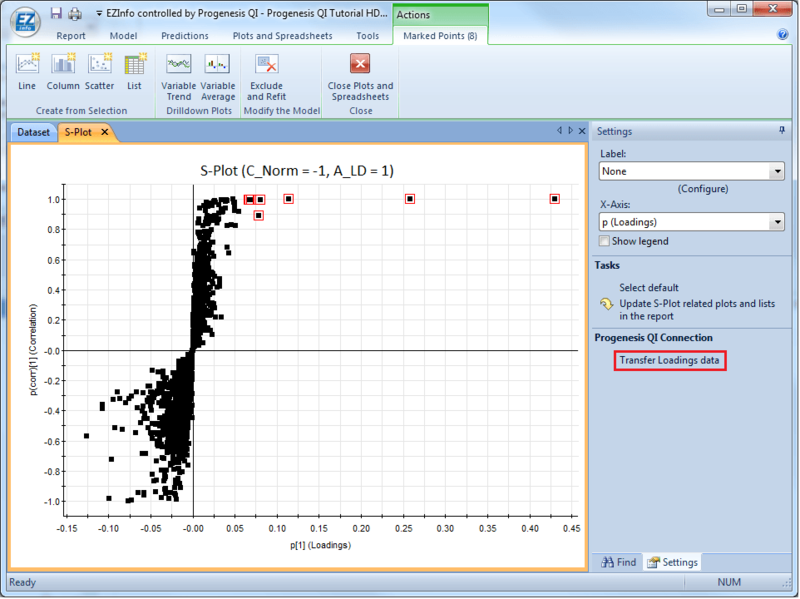 EZinfo (Umetrics, Sweden) is a separate statistical package that can be used in conjuction with Progenesis QI. 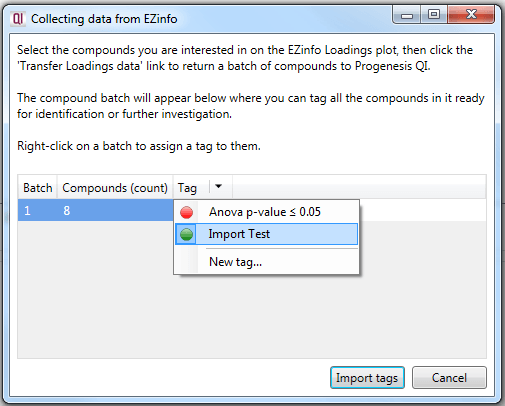 Compound measurement data can be exported to EZinfo, analyses performed in that software, and lists of compounds of interest derived from EZinfo can be returned to Progenesis QI as tag groups. 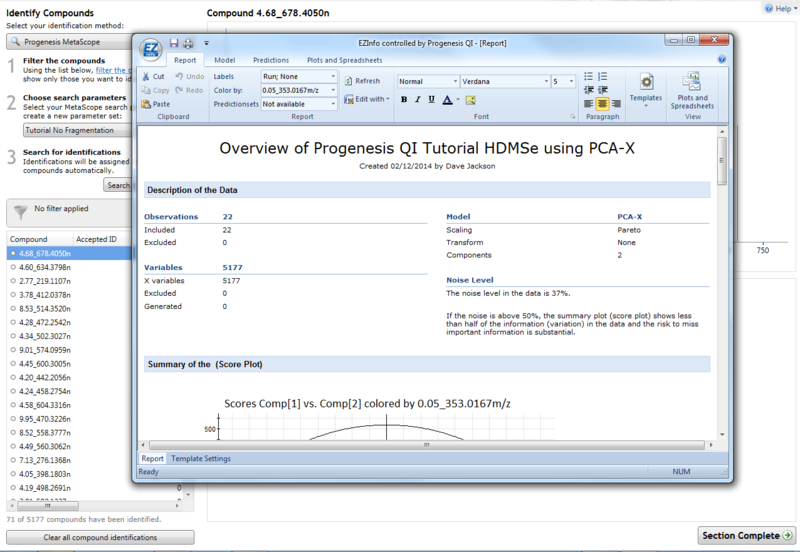 In this way, the results can be visualised just as for those derived from Progenesis QI directly. 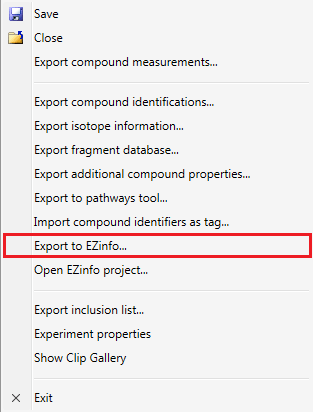 To export your compound data to EZinfo, select File | Export to EZinfo at the Identify Compounds, Review Compounds or Compound Statistics stages of the workflow. The Export to EZinfo… option as it appears from the Identify Compounds page. You will be prompted to save an EZinfo project file (.usp) and on saving this, a dialog will inform you that either all compounds, or the currently selected set of compounds (if you have filtered using tags) are being exported. The launch page for EZinfo analysis. You can now work on your data in EZinfo, and save the work within that program as desired. As EZinfo is separate software, its user guide should be consulted for analyses using it. However, your analysis will be set up correctly for interrogation automatically. 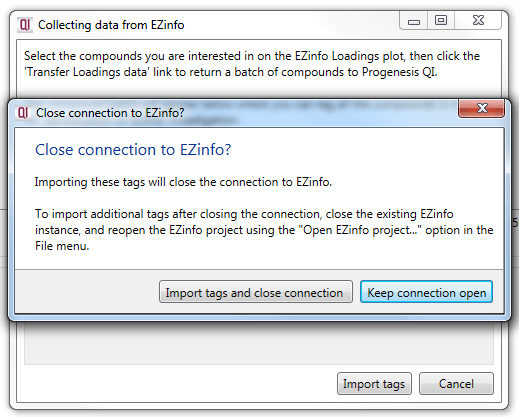 EZinfo is set up to import lists of compounds it has determined as significant back into Progenesis QI, as tag groups. It maintains a link to Progenesis QI while active. An S-plot in EZinfo comparing two of the tutorial data set conditions, with eight compounds selected for importing back into Progenesis QI and the Transfer Loadings data option highlighted by the red box. These compounds can be returned as a tag group to Progenesis QI, which will have remained open in the background, by selecting “Transfer Loadings data”. This will cause the marked compounds to appear in Progenesis QI’s interface to EZinfo – you can minimise EZinfo to see this. A ‘batch’ of compound identities results from each transfer, keeping different selections segregated so that you can assign them unique tags. 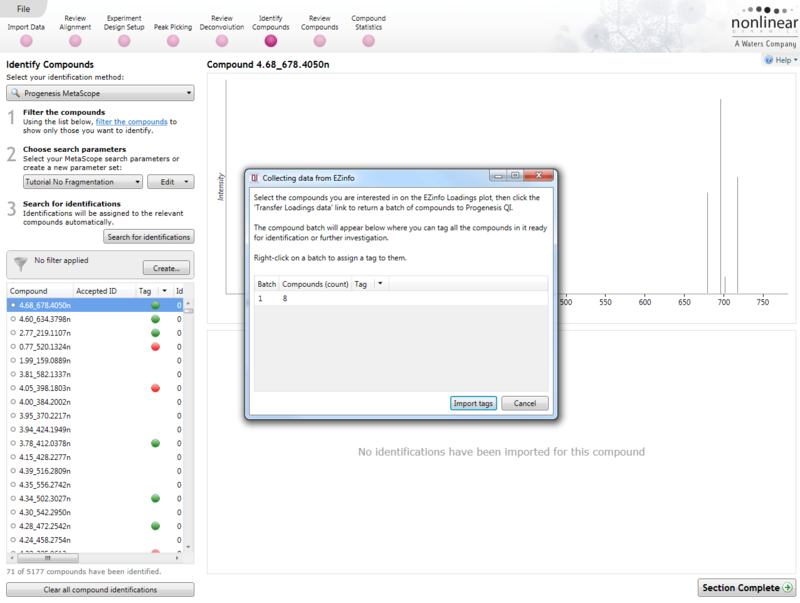 The Progenesis QI data collection dialog, which is the link to an active EZinfo analysis, showing any batches of returned compounds. Selecting a tag that will be applied to the batch of compounds on their import back into Progenesis QI, using the drop-down arrow. The prompt that will appear on selecting Import tags from the data collection dialog. Importing tags will close the EZinfo connection, but this can be reopened for further analyses (see below). The tags will be applied to your compounds, completing the link between the two programs. Note that the EZinfo project remains open after this has been done, and should be closed independently. A saved EZinfo project associated with an experiment can also be reopened to continue an EZinfo analysis, or to select and import more tag groups. To do this, instead of exporting to EZinfo, simply select “Open EZinfo project” from the File menu, as shown below. This will open the existing project with a live connection to Progenesis QI. The Open EZinfo project… option as it appears from the Identify Compounds page.